I didn’t spend much time in Frankfurt, but I did manage to take a short trip around their underground railway (U-Bahn) network. At Hauptbahnhof station I came across what looked like a disused platform, with the only clue being a ‘Feuerwehr Übungstunnel’ sign on the steel gate that blocked access into the pitch black tunnel beyond. My girlfriend is no gunzel, but she does understand German, so was able to tell me that the rough translation was ‘tunnel for firefighters’. VerkehrsGesellschaft Frankfurt am Main (VGF) have expanded their collaboration with the local fire department. For firefighting training purposes, a disused type “Pt” U-Bahn carriage and a disused section of tunnel at Hauptbahnhof have been provided. Despite the close proximity to the platforms for customers of VGF, there are no obstacles to the operation of regular services. The only other similar training facility is on the BVG network in Berlin. With this new facility the skills of rescue workers can be maintained at a high level, and emergencies can be rehearsed as realistically as possible. The training plan for each fire department member will be taught in four sections, with exercises conducted in the facility weekly. Their visors will be blackened to make the conditions more difficult. The facility is secured by gates, which are designed to prevent the escape of smoke into the public tunnel area. Also part of the collaboration is the acquisition of two rescue vehicles for fire fighting in the tunnel area, at a cost of one million Euros. A squad of firefighters in protective suits trudge through platform 4 at Frankfurt Hauptbahnhof, to the sounds of a radio: “Attention! Fire in the underground tunnels, there are people in the car”. Men rolling red hoses, put on their masks and rush towards the tunnel. Just past the entrance to the underground tunnel Wolfgang Gottschalk is waiting: “Stop, smoke limit,” he calls. In turn, the instructor every firefighter attaches a dark gray lens to their visor, limiting their view to a few centimetres – as with dense smoke. Every Wednesday firefighters have been rehearsing for the real thing. They are practising at Hauptbahnhof in a disused carriage, as since January they have their own training tunnel made available by VerkehrsGesellschaft Frankfurt am Main (VGF). “These are of course much better conditions,” said fire department spokesman Hans-Jürgen Bohnert. Such a possibility was previously only available in Berlin. Within a year, all 840 emergency personnel of the the Frankfurt fire department will descend into the tunnel for a day of training. The spokesman added that such a fire is very unlikely. In the past there have been few smaller fires in a tunnel. 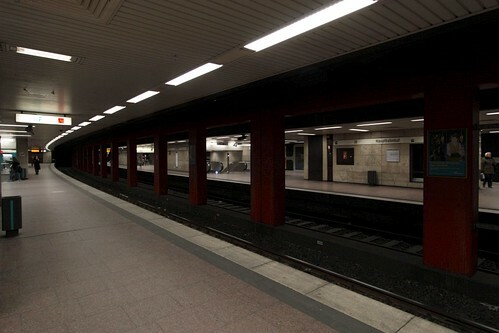 As for the reason for the platform being unused, Hauptbahnhof station opened in 1980 as part of the U4 line, which was extended to Bockenheimer Warte in 2001, with the extra platform intended to form section III of future line ‘D’ from Hauptbahnhof to Niederrad. 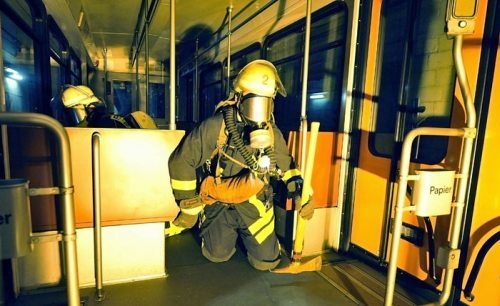 In 2013 Frankfurt’s firefighters were given a second train to play with. Located at the Fire and Rescue Training Center, the train was only a few years old when it was damaged by flood waters, leaving it uneconomical to repair, so they were stripped for parts then placed into a mock subway station. The delivery of the carriages was in itself interesting – they were dropped off at a U-Bahn station, then dragged out of the tunnel with a hi-rail fire truck! 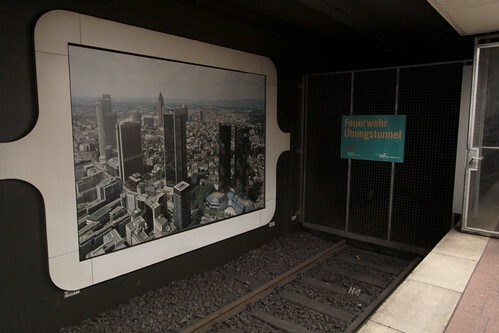 This entry was posted in Trains and tagged emergency services, firefighting, Frankfurt, Germany, U-Bahn. Bookmark the permalink.